Do you know what you’ll owe this year on your taxes? Do you understand why you’re liable for certain taxes and not others? Filing taxes can be daunting for most, but you’re not alone. When it comes to filing taxes and tax preparation in Aurora, you will find help at Five Star Multiple Services. Our tax professionals will help you prepare and file your taxes so you save money and get the correct return. If you’re not sure how to report your income for the previous year, or you feel as though you’re losing money every year, give us a call today. In the meantime, we’ve put together the top three reasons to hire a tax professional to save you money, time, and sanity during tax season. Taxes revolve around money, percentages, and what’s owed. When it comes to saving money, a single mistake could mean hundreds lost to the government. When it comes to filing your taxes, hire a tax professional and get rid of the mistakes. Specific deductions for your living situation, lifestyle, and other factors could mean a reduction in tax liability. This means the mileage driven in your vehicle for business purposes can be claimed. Did you purchase a new device or item for work? You may be able to write it off. A tax preparation professional is aware of how to file taxes to reduce liability and increase returns, which means you’re saving money instead of paying it into the government. Do you stay up late during tax season attempting to figure out your income, your deductions, your dependents, and what you owe to the government? You don’t need to spend numerous late nights struggling with tax code you may or may not understand. While you’re tired, mistakes are likely to happen, which means paying more than necessary. Additionally, when you spend time working on your taxes, you lose sleep, which takes away from your job, your family, and yourself. Instead, give Five Star Multiple Services in Aurora a call to hire a tax preparation professional. Did you file your own taxes? Did you file your taxes correctly? In most cases, our clients express worry, fear, and general anxiety when it comes to filling their own taxes. They aren’t sure if they filed them correctly, and if they made a mistake, it could break the bank, putting themselves and their family in jeopardy financially. You no longer have to live worrying whether or not you filed your taxes properly. Our team has been serving the Aurora area for years. 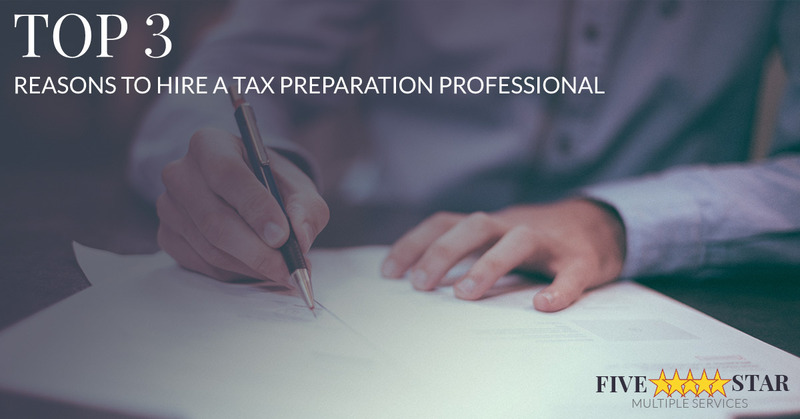 We know what it takes to prepare and file taxes correctly, and our current clients tell us they could not see a life without our tax preparation services. Stop worrying about your taxes. Hire a tax preparation professional. You deserve to live your life stress-free and without fear of the IRS. Nonetheless, if you’re struggling with your taxes, or find you don’t know how to file them, give us a call today! We’re here to serve you and your tax needs.